Raw milk can be sold only in the state where it was produced. Raw milk and raw milk derived products cannot be sold across state lines or internationally. The sale of raw milk (unpasteurized milk) milk for human consumption is prohibited by federal law through the U.S. Food and Drug Administration (FDA). The FDA advises states not to permit the sale of raw milk.The FDA also forbids states from allowing the sale of products made from raw milk, such as yogurt, cottage cheese, butter and ice cream. Some hard cheeses, such as cheddar and Swiss, can be legally made from raw milk. As of March 2018, 31 states allow for consumers to purchase raw milk directly from the producer, within their state. In many states, raw milk can be only purchased at the farm, at farmers’ markets or through a "cow-share" program, where consumers combine resources to purchase a dairy cow. 12 states allow consumers to buy raw milk at retail stores. 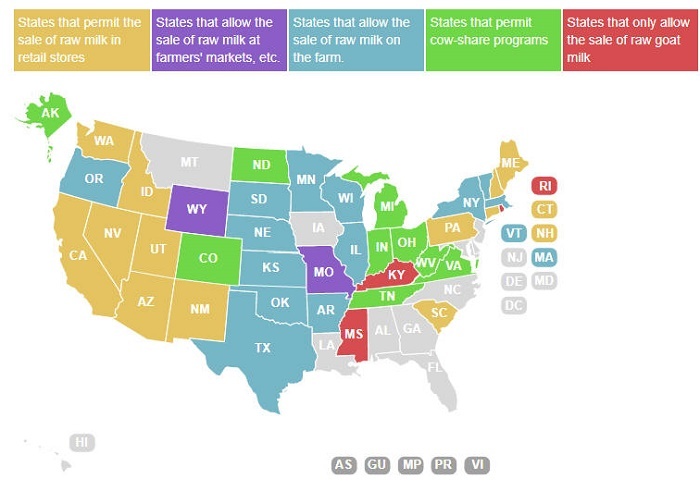 In the remaining 19 states, the sale of raw milk to consumers is prohibited. Raw milk, however, can be purchased for animal consumption, which is how people in these states get around the law. Here is a map showing the status of state laws considering the sale and consumption of raw milk. Click here for more current state raw milk law information.